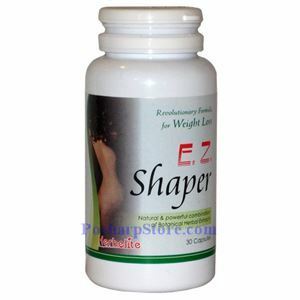 EZ Shaper reduces weight without need of dieting and exercise. EZ Shaper has no side effects. EZ Shaper is 100% herbal blend! E.Z. Shaper is an amazing formula that utilizes botanical herbal extracts as its primary ingredients. E.Z. Shaper naturally reduces food cravings, curbs the appetite, controls caloric intake and sustains energy without the side effects experienced by other leading weight loss formulas. E.Z. Shaper shapes your physique by targeting problem areas such as the neck, abdomen, waist and hips. It safely and effectively trims your waistline, flattens your stomach and eliminates bloating. E.Z. Shaper’s ingredients are purified and refined with a modern technology called “Topology”. From a biochemical standpoint, this formula works by blocking the synthesis of fat and prohibiting production of the enzymes that are responsible for fat formation. E.Z. Shaper burns fat and cleanses your body system without need of altering your diet and exercise routines. EZ Shaper has no side effects ‐ 100% herbal blend! Because E.Z. Shaper’s ingredients are derived from natural substances, there are no harmful side effects! Active ingredients include: Polygonum multiflorum, Gynostemma pentaphyllum, Lotus leaf, Mulberry, Aloe, Fructus Crataegi, Ganoderma lucidum, Alisma orientale, Spirulina, and Calcium pyruvate. E.Z. Shaper guarantees Loss up to 5 ‐15 pounds per bottle! Once you are satisfied with your overall physique, simply discontinue using E.Z. Shaper, or maintain your results by taking one to two capsules every two to three days. Notice: Do not take this product if you have heart disease, high blood pressure, and any other medical condition, consult your physician before useing this product. This product is not for children,teenagers who are under 18, pregnant women, breast feed period women. DISCLAIMER These statements have not been evaluated by the Food and Drug Administration. This product is not intended to diagnose, treat, cure, or prevent any disease.